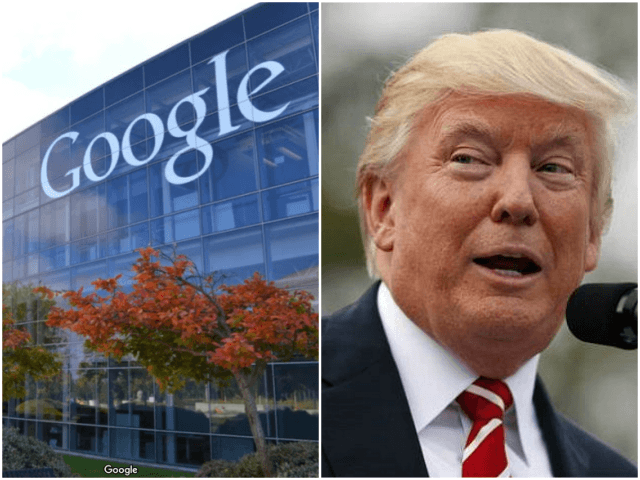 Alon Altman, a senior software engineer at Google, pressured the company to sabotage President Trump’s Android phone, according to new evidence released via James Damore’s class-action lawsuit against the company. Altman – who is still employed by the tech giant – also called on Google to blacklist “alt-right’ sites on the Google ad network (she falsely included Breitbart News in this category — an assertion refuted by a Harvard and M.I.T. study), and take down all “alt right videos” from YouTube. She also called on the tech giant to remove “neo-Nazi sites such as ‘The Daily Stormer'” from the Google search index. Altman has been employed at Google for seven years, and according to inside sources, is one of the most radical leftists at the company. She was named as one of the key architects of political discrimination at Google by a whistleblower we interviewed last August. As we have reported, she has previously called on the company to discipline or terminate any employee who agreed with James Damore’s viewpoint diversity manifesto, which argued that there was an atmosphere of political intolerance at Google. 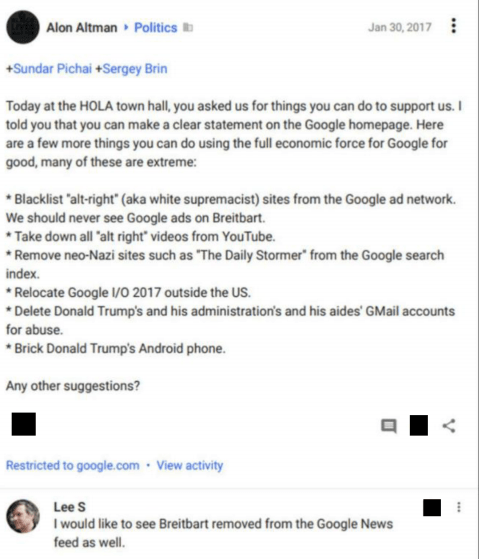 Google seemed to follow at least one of Altman’s suggestions, effectively kicking The Daily Stormer off the internet in August 2017, a move that was condemned even by the left-leaning Electronic Frontier Foundation (EFF). While Google did not follow Altman’s suggestion to remove Breitbart News from its ad network, its employees have begun advising clients to steer clear of Breitbart News, as we exclusively reported in February. More evidence that Google’s ad departments are trying to undermine the revenue of conservative sites has just been released via the Damore lawsuit. 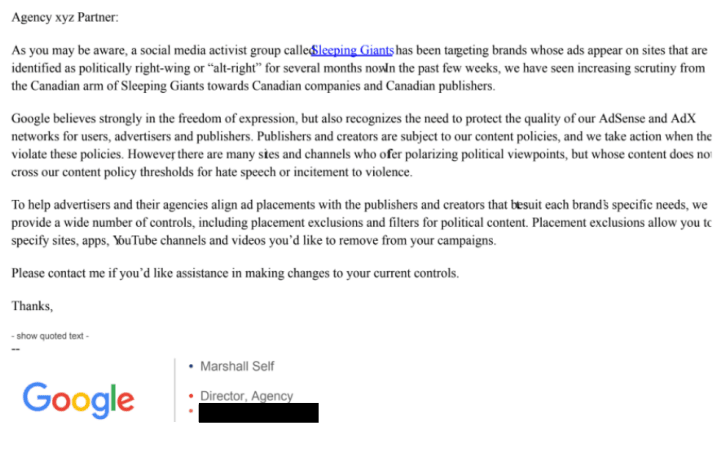 According to the lawsuit, when Google’s “Large Customer Sales” (LCS) team learned that the Canadian conservative news site The Rebel Media had been targeted by the far-left group Sleeping Giants, they used this as an excuse to advise clients to remove ad placements from conservative websites. 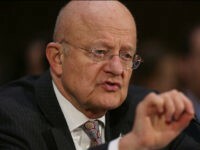 In a template email to Google clients, Marshall Self, Director of Agency at Google, recommended that clients take advantage of Google’s “wide number of controls, including placement exclusions and filters for political content” to remove ads from specific sites, apps, YouTube channels and videos. Three new plaintiffs have joined Damore’s lawsuit against Google, which alleges that the company discriminates against white, Asian, male, and conservative individuals.